Flowers and chocolate are a Valentine’s Day staple, but it looks like there’s an even better way to show someone you love them. Walmart is taking the classic combo to the next level by offering a bouquet that will appeal to your sweetheart’s sweet tooth. 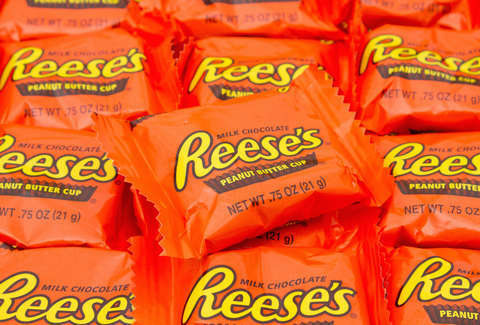 The retailer is currently selling what’s dubbed the “Reese’s Extravaganza Bouquet,” which features 36 packs of Reese’s peanut butter cups set among matching fake flowers. It’s truly a thing of bright orange beauty. But because Reese’s aren’t for everyone, Walmart’s crafted similar bouquets using other popular candies, like Twizzlers, Baby Ruths, Ferrero Rocher, Kit Kats, and M&M’s. “This beautifully wrapped extravaganza bouquet will show your loved one how much you care,” the product description continues. True, because nothing says “I get you” quite like feeding into your significant other’s chocolate and peanut butter addiction. Love is a strange thing, isn’t it? Anyway, if you’re still racking your brain for the perfect Valentine’s Day gift, look no further than Walmart’s mountain -- er, we mean bouquet -- of candy. Your relationship may not last forever, but the stomach ache they experience after scarfing down 36 packs of peanut butter cups just might.